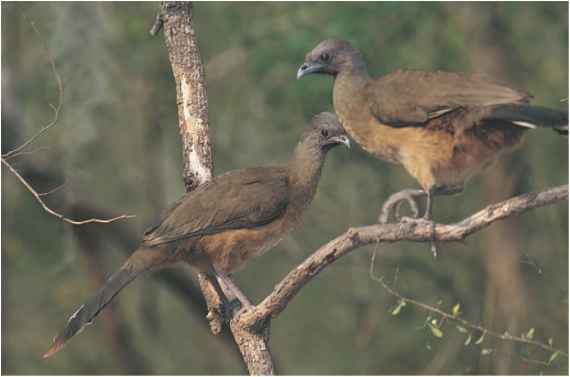 Physical characteristics: The plain chachalaca weighs 15.5 to 28 ounces (440 to 794 grams) and measures 19 to 22.8 inches (48 to 58 centimeters) long. Coloration is olive-brown. Geographic range: This species is found in Texas, Mexico, and Costa Rica. Habitat: Plain chachalacas live in lowland forests as well as forests at the base of mountains in Central America. They also dwell in scrub and tall brush vegetation. Diet: The bulk of their diet is made up of fleshy fruit. They also eat green leaves, shoots, and buds as well as twigs and some insects. Though chachalacas live mostly in trees, they descend to the ground for feeding. Behavior and reproduction: This social bird has a distinct "cha cha lack, cha cha lack" call which nearby chachalacas sing in chorus. Most humans find it an unpleasant sound. Nests are built 3.3 to 33 feet (1 to 10 meters) off the ground in trees. Females lay two to four eggs and incubate them for about twenty-five days.